All the photos from George Calombaris' wedding to wife Natalie Tricarico. 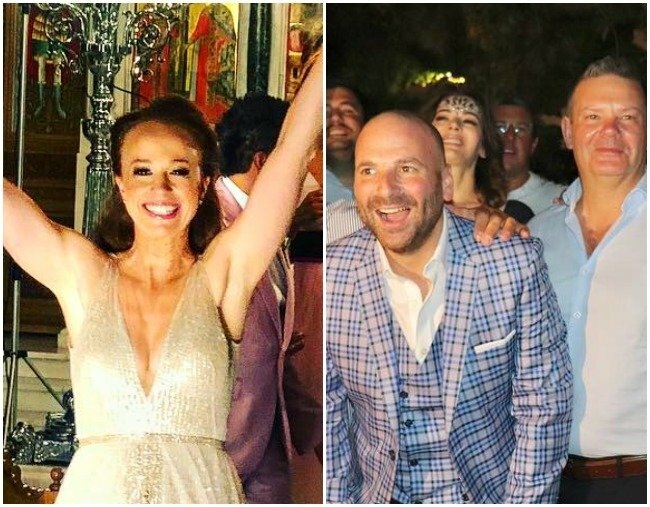 George Calombaris just married his long-time partner in a spectacular Greece wedding. It’s come to our attention that Masterchef judge George Calombaris has gotten married to his long-time partner, Natalie Tricarico, in a Greek wedding that has lasted at least two days. Although the couple has yet to confirm the nuptials themselves, photos of their wedding have circulated social media thanks to their chef friends. And if you’re a foodie or Masterchef fan, prepared to play spot-the-chef, with the likes of Nigella Lawson, Shannon Bennett, Manu Feildel, Alastair McLeod, Matt Moran, and of course Calombaris’ Masterchef co-judges, Matt Preston and Gary Mehigan. British chef, Sat Bains also shared a photo of the bride, who looked stunning in a shimmering, champagne frock with a pink centre-split. Her dress matched her daughter’s, Michaela Calombaris, who is standing to her left. Natalie and George were both divorced before they met in 2007, and have been together for 11 years. They also share two children together – seven-year-old James and five-year-old Michaela. According to the Greek City Times, the couple celebrated their wedding at the Island Club in the Athens Riviera which overlooks the Athenian sea, while the ceremony itself looked like it took place in a Greek Orthodox church. Stunning Mediterranean views aside, as you can imagine, the food looked equally as good – think never-ending fig tarts, chocolate and hazelnut tarts, and entire rotisserie meats. The worlds longest chocolate and hazelnut tart, (with the world’s longest fig tart in the background) by Greece’s supreme pastry chef, @steliosparliaros . So good! What do you think of George Calombaris’ wedding? Tell us in a comment!